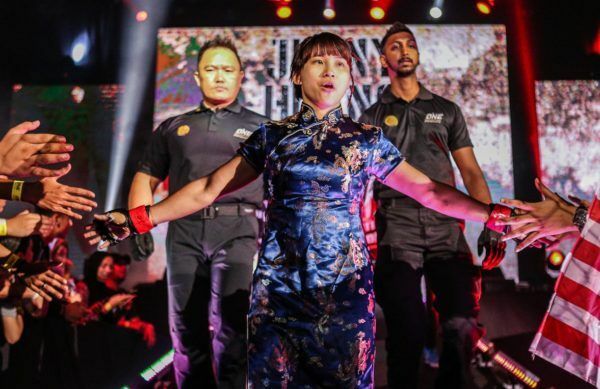 Jenny “Lady GoGo” Huang has trained with some of the best strikers in the world ahead of her bout with Jihin “Shadow Cat” Radzuan. The Chinese star is known for pulling off some of the most sensational submissions in ONE Championship’s atomweight division, but she has traveled to the world-renowned Fairtex Gym in Pattaya, Thailand to supercharge her overall skill set. The 27-year-old is no stranger to taking her training camps to different facilities across Asia, and in Fairtex, she says she has found the perfect place to prepare for her atomweight contest at ONE: DESTINY OF CHAMPIONS this Friday, 7 December. “There have always been athletes who want to go to Thailand to learn to fight and make progress,” she says. “There are many famous fighters gathered from all over the world. Fairtex has many powerful fighters, such as Yodsanklai – Muay Thai champion – and Stamp – who is also the kickboxing champion of ONE Championship. There are also many good fighters from different countries. “Communicating and exchanging information in different environments can give you an advantage. Training with many athletes of different styles can quickly help you absorb their skills, and give you a lot of experience. The gym’s most famous product, Yodsanklai IWE Fairtex, will join Huang on the bill at the Axiata Arena in Kuala Lumpur, Malaysia. “The Hero” will face Luis “Soot Raaeng Geert” Regis in a ONE Super Series Muay Thai featherweight bout in the evening’s main event. “Lady GoGo” was familiar with the living legend before she arrived in Thailand, and says she is delighted to train alongside, and feature on the same card as him. “Yodsanklai is a very strong and famous Muay Thai fighter. He is also very famous in China,” she adds. Despite being surrounded by so many elite Muay Thai practitioners, the judo black belt’s focus has not only been centered on the art of eight limbs. 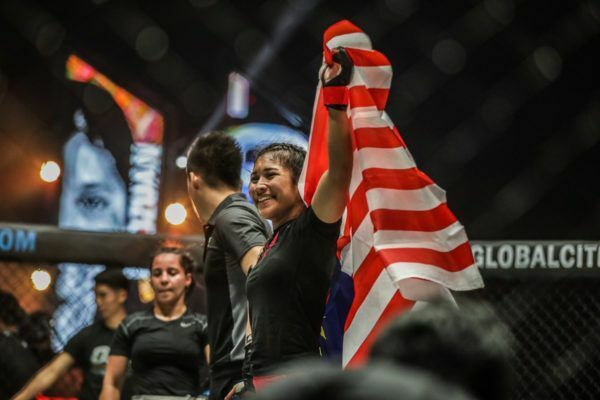 When she meets Jihin in Kuala Lumpur, she will face a well-rounded athlete with excellent grappling skills on top of her striking attack. Fortunately, Fairtex is well-equipped to bring Huang along in all aspects of mixed martial arts. “I trained with many fighters from different countries, including Chloe [Fisher Cooke] – the Muay Thai Champion of England – Stamp, Mark [Fairtex Abelardo] and many others who helped me improve my fighting skills in various aspects,” she explains. “The coach helped me improve my standing skills, wrestling skills, and ground skills in all respects. “Lady GoGo’s” time in Thailand has been so productive, she has plans to return to prepare for her future bouts, too. Once her upcoming contest is in the rearview mirror, and her schedule is set, she will be back on the mats and in the rings to continue her evolution as a martial artist, and push towards a second shot at the ONE Atomweight World Title in 2019. “I will stay here for more than one year and keep improving my abilities,” she says.